HyperX, the gaming division of Kingston Technology, has announced several new products for CES 2017. 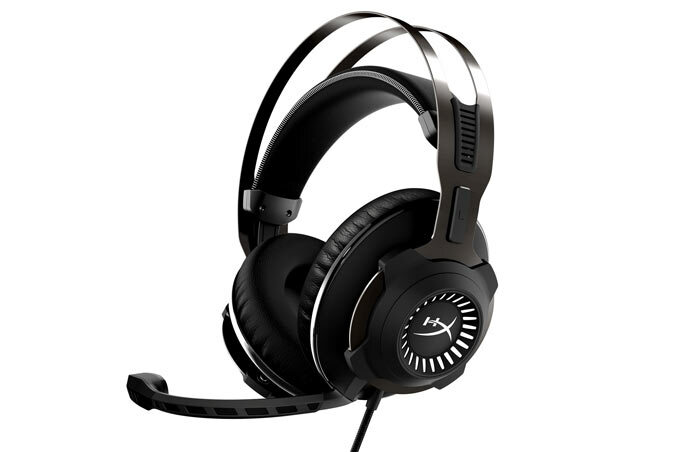 The firm has a brand new headset called the Cloud Revolver S which offers plug-and-play Dolby 7.1 Surround Sound. Furthermore it announced some new PC gaming peripherals; the Alloy gaming keyboard range and the Pulsefire gaming mouse. This headset is the most advanced to date from HyperX. Perhaps its biggest single attraction is the provision of plug-and-play Dolby 7.1 Surround Sound. Dolby's headphone tech is embedded in a USB dongle and can be toggled with the touch of a button. Users have quick access switching between three pre-set equaliser settings. Rounding off its user friendliness, the Cloud Revolver S features independent volume and microphone mute buttons, and a backlit display to quickly check active modes. The headset uses memory foam ear cups and a wide headband for long lasting comfort. Inside the cups are its 50mm neodymium magnet equipped dynamic drivers. Attached to the headset is a bi-directional, noise-cancelling electret condenser microphone. HyperX Cloud Revolver S headsets will become available from 14th March with an RRP of £139.99. This new gaming keyboard is said to be a completely new design from HyperX. The name comes from the use of a steel alloy keyboard frame for enhanced rigidity and durability. As you can see, the keyboard uses a space-saving layout to give you more desk space for your mousing activity. Other features include 16 million colour LED backlighting and choice of Cherry MX Brown or Red Keyswitches. You will find function toggled media keys are equipped for your convenience. 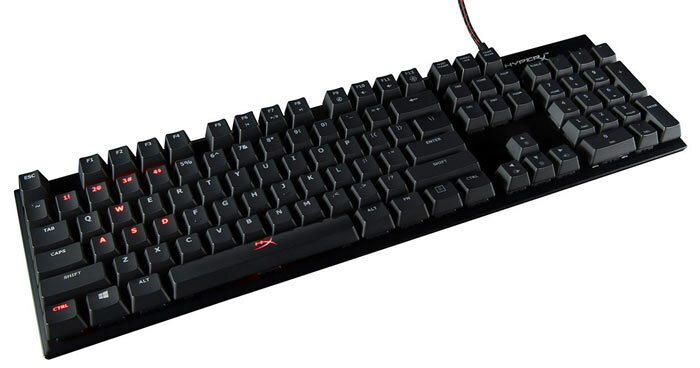 If RGB LED lighting isn't required HyperX is making available the HyperX Alloy FPS Gaming Keyboards with your choice of Cherry MX Brown or Red keyswitches. Specifically for these models HyperX says that textured red WASD keys come as standard. LEDs on these models are red-only and software-less, with profiles adjusted and changed via keyboard hotkeys. We don't have much detail about this new rodent. HyperX says that it is it's first ever mouse and is "designed for professional gamers". 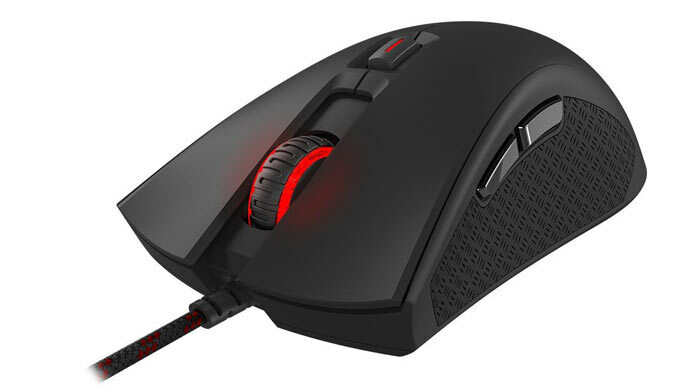 You will find this mouse offers an optical gaming sensor with four preset DPI settings and LED indicators (400/800/1600/3200dpi). Presets are changed without any additional software required. Last but not least the Pulsefire is said to be "surprisingly affordable". HyperX's peripherals aren’t due very soon according to our press release. The Alloy RGB keyboard will arrive in Q3 2017, the Alloy FPS keyboards in a rather vague '2017', and the Pulsefire mouse is due in April. With launch dates so distant and vague you won't be surprised that we don't have price indications. For more HyperX thrills and spills the firm is live streaming its CES press event here at 4pm UK time on Thursday.